I finally got my hands on this recent release and I’m so happy I did! ‘Haunted Horror’ is a new comic book series from Yoe Comics, an imprint of IDW Publishing. This series will be a collection of horror stories unearthed from the multitude of pre-comic code comic books from the 1950s. The book is the brainchild of Craig Yoe head of the aptly named Yoe! Studios which produces a marvelous collection of comic book/comic strip merchandise (I still have to get his Little Lulu and Tubby figures but check it out his book line, I have some but want them all! 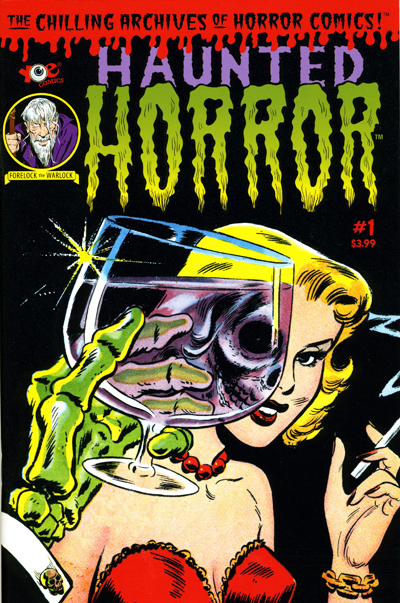 http://yoebooks.com/) Yoe is the editor along with Steve ‘Karswell’ Banes (who’s website http://thehorrorsofitall.blogspot.com/ is in itself an amazing collection of horror stories from vintage to modern comic books) and Clizia Gussoni, Yoe’s wife and business partner. The first story is ‘The Wage-Earners’ a swampy tale that shows you one bad turn deserves another! It features some creepy characters drawn by artist C.A. Winter. Next up is ‘The Constant Eye’ which features man being haunted by a zombie that keeps turning up in the most unusual places sometimes even in drag! This one is by Bernard Baily who co-created DC Comics’ The Spectre. ‘Black Magic In A Slinky Gown’ is the next tale about a villainous woman who draws some male victims into her web. ‘Slaughter-House’ is by the legendary team of Jack Kirby and Joe Simon. This one has a science fiction angle about a horrible choice made to survive an alien invasion. ‘The Vengeful Curse’ is by Jack Cole (one of my all-time favorite artists, known for creating Plastic Man) This story proves you shouldn’t build your house on top of your murder victim. The final story is ‘Ultimate Destiny’ by Jay Disbrow. This story reminded me of an H. P. Lovecraft tale with a doctor who disappears after seeing the end result of a patient suffering from a horrible curse. The last page of this one is pretty twisted, one you will not forget anytime soon! All these stories are introduced by the host of the comic book, Forelock the Warlock, drawn by none other than the legendary Angelo Torres based on Yoe himself! I give this book my highest recommendation for all you horror fans out there, so run and get your copy before they’re all devoured by comic book zombies!